My grandma loved to tell the story of how the first movie that she saw in a theater was The Wizard of Oz. She was so terrified by the flying monkeys that she dove under her seat and refused to come out for the rest of the movie. I can see how it could have been frightening to a small child who wasn't accustomed to seeing movies on a big screen but nothing beats the creepiness of Return to Oz, the 1985 sequel to The Wizard of Oz starring a young Fairuza Balk. Synopsis: "Dorothy, saved from a psychiatric experiment by a mysterious girl, is somehow called back to Oz when a vain witch and the Nome King destroy everything that makes the magical land beautiful." Return to Oz is the reason for my unusual discomfort around chicken motifs, but don't get me wrong - I loved this movie when I was a kid! So you can probably imagine my delight when I discovered this fan art by "Tayor is Blue" on deviantART. I absolutely adore it! 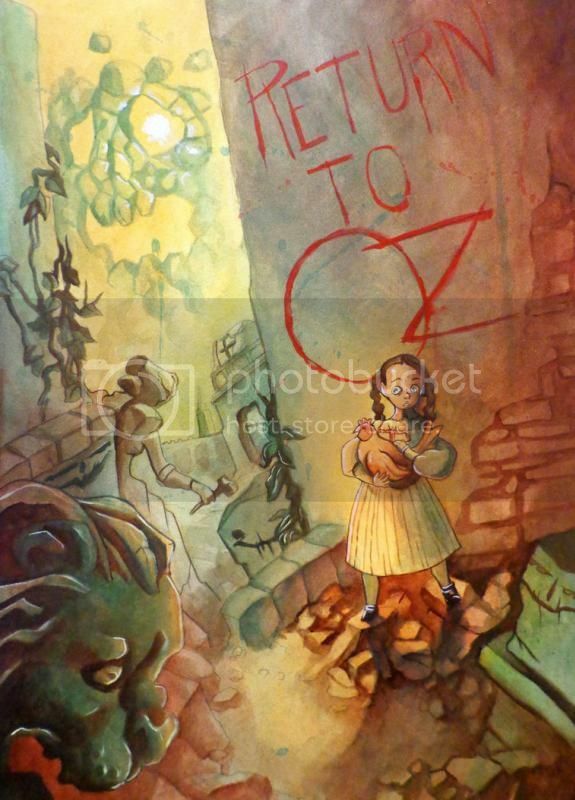 Were you a fan of Return to Oz?